Living one’s life in the present moment is a radical idea. There is a tremendous amount of pressure in western society to focus on what we did before and on what is going to happen next. Conversely, the idea of enjoying the present moment without trying to alter it is distasteful to many people. The irony of that reality is that there is no happiness to be gained by grasping at the past and the future. That is just a never ending cycle of worries and regrets. 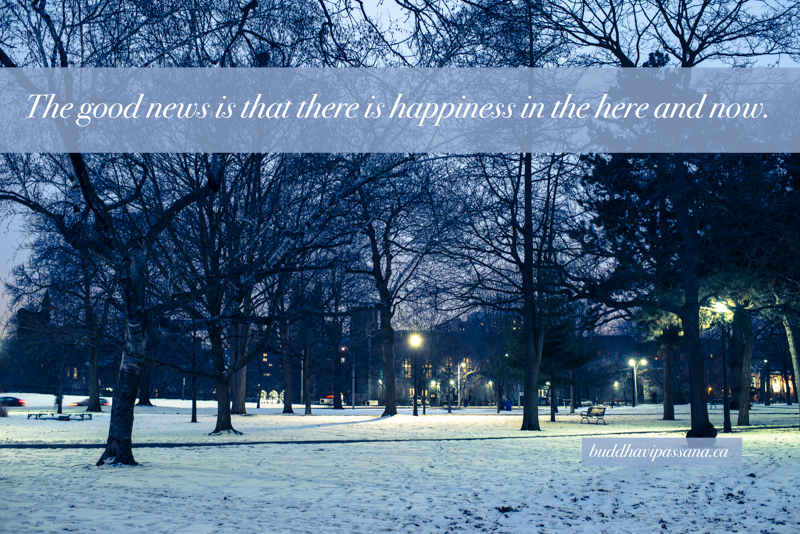 The good news is that there is happiness in the here and now. Everyone can train the mind to be in the present moment and observe this reality for him or herself. The simple acts of observing the body, feelings, mind and mind objects reveal that in the present moment everything is fine and there is nothing to worry about. The problem comes when the mind escapes to the past or the future again. If we are trained, we have confidence in the effect of simply brining the mind back to the present moment and then everything is fine again. First, we need to have the courage to go against the traditional view that happiness must exist in the future and to accept that it can exist in the here in now. That is what insight meditation is all about. I encourage you to start your training and see for yourself.